王莉莉, 龚建东, 2018. 两种OI陆面同化方法在GRAPES_Meso模式中的初步应用试验[J]. 气象, 44(7): 857-868. DOI: 10.7519/j.issn.1000-0526.2018.07.001. WANG Lili, GONG Jiandong, 2018. Application of Two OI Land Surface Assimilation Techniques in GRAPES_Meso[J]. Meteorological Monthly, 44(7): 857-868. DOI: 10.7519/j.issn.1000-0526.2018.07.001. Abstract: The initial soil water content and temperature significantly influence numerical weather forecasts. The Optimal Interpolation (OI) technique takes into account observation and forecast errors in an objective statistical way and can produce the analyzed soil water content and temperature. 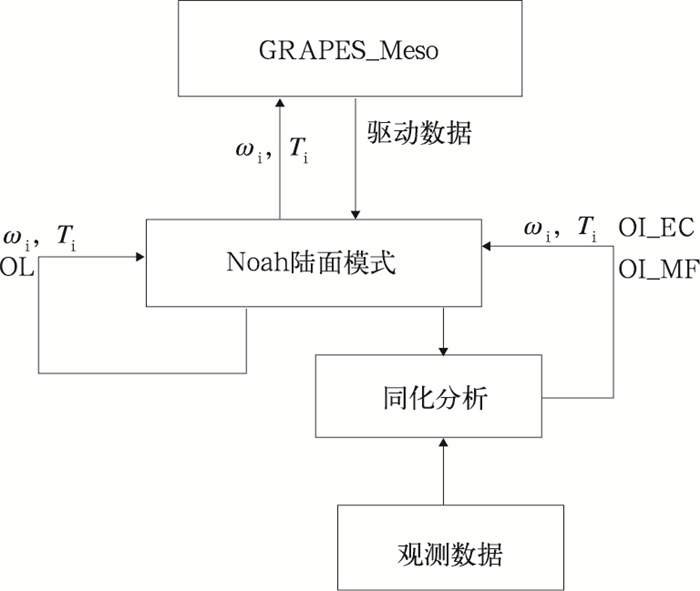 The OI_EC and OI_MF, which were developed from the original OI technique, have been used in the operational systems in European Centre for Medium-Range Weather Forecasts and in Météo-France, but not in the GRAPES_Meso of China. So, we tried to apply the two OI techniques in the GRAPES_Meso. 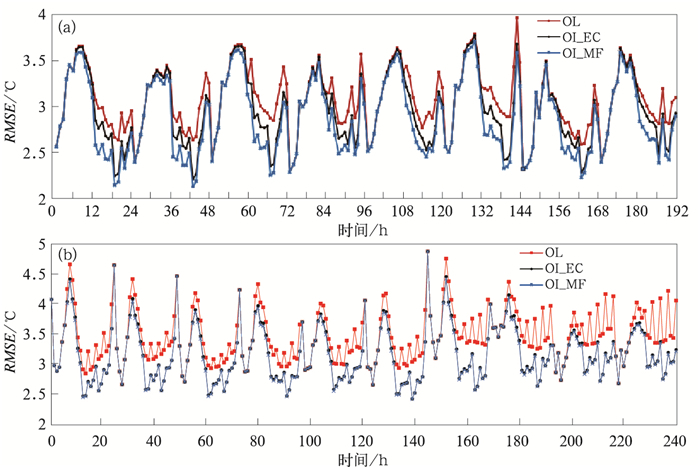 The experiment results of the two seasons in summer and winter show that the accuracy of the simulated 2 m temperature is improved by the use of the two OI techniques, and there is no obvious change in precipitation simulation results. Comparing the results of two OI techniques, we find that the OI_EC coefficients are more reasonable, and the OI_MF method is not suitable for simulating in the low vegetation coverage area. Note: 1 h represents the mean RMSE in 24 h; 6 h represents the mean RMSE of the first 6 h results; 12 h represents the mean RMSE of the first 12 h results; 24 h represents the mean RMSE of the 24 h results. Note: Same as Table 1. 黄春林, 李新, 2006. 土壤水分同化系统的敏感性试验研究[J]. 水科学进展, 17(4): 457-465. 贾炳浩, 谢正辉, 田向军, 等, 2010. 基于微波亮温及集合Kalman滤波的土壤湿度同化方案[J]. 中国科学:地球科学, 40(2): 239-251. 林朝晖, 杨小松, 郭裕福, 2001. 陆面过程模式对土壤含水量初值的敏感性研究[J]. 气候与环境研究, 6(2): 240-248. 师春香, 谢正辉, 钱辉, 等, 2011. 基于卫星遥感资料的中国区域土壤湿度EnKF数据同化[J]. 中国科学:地球科学, 41(3): 375-385. 田向军, 谢正辉, 2008. 考虑次网格变异性和土壤冻融过程的土壤湿度同化方案[J]. 中国科学:地球科学, 38(5): 1-9. Coiffier J, Ernie Y, Geleyn J F, et al, 2015. The operational hemispheric model at the French Meteorological Service[J]. J Meteor Soc Japan, Special NWP Symposium Volume: 337-345. Douville H, Viterbo P, Mahfouf J F, et al, 2000. Evaluation of the optimum interpolation and nudging techniques for soil moisture analysis using fife data[J]. Mon Wea Rev, 128(6): 5424-5432. Draper C S, Mahfouf J F, Walker J P, 2011. Root zone soil moisture from the assimilation of screen-level variables and remotely sensed soil moisture[J]. J Geophys Res, 116(D2): 3-25. Giard D, Bazile E, 1996. Assimilation of soil temperature and water content with ISBA in ARPEGE: some new developments and tests[J]. HIRLAM Newsl, No. 24, Swedish Meteorological and Hydrological Institute: 34-42. Giard D, Bazile E, 2010. 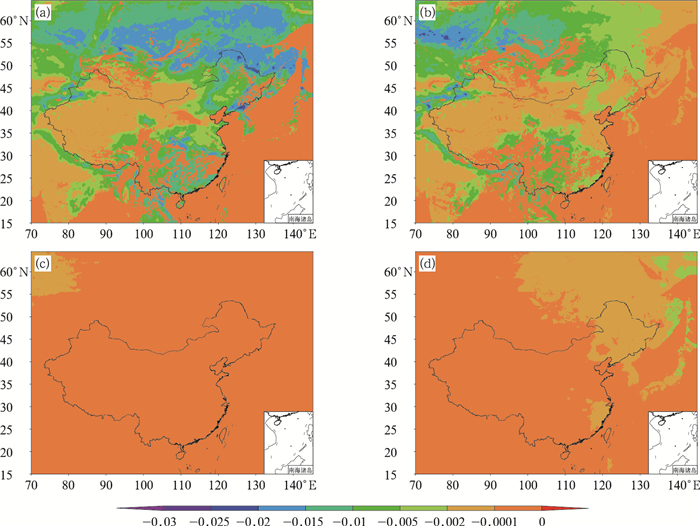 Implementation of a new assimilation scheme for soil and surface variables in a global NWP model[J]. Mon Wea Rev, 128(4): 997-1015. Mahfouf J F, Bergaoui K, Draper C, et al, 2009. A comparison of two off-line soil analysis schemes for assimilation of screen level observations[J]. J Geophy Res, 114(D8): D08105-D08125. Mahfouf J F, Manzi A O, Noilhan J, et al, 1995. The land surface scheme ISBA within the Météo-France climate model ARPEGE. Part Ⅰ. Implementation and preliminary results[J]. J Climate, 8(1995): 2039-2057.